In 2017, Western Europe became the most prosperous region in the world, with its nations holding seven of the top 10 ranks. 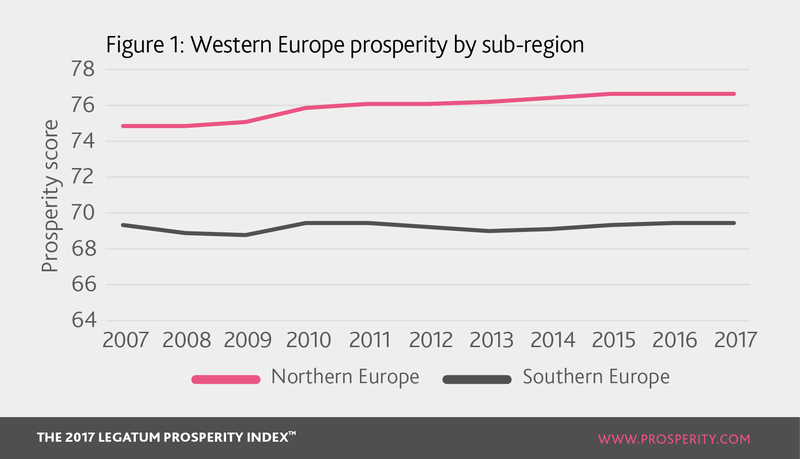 However, this result did not come from gains in its prosperity - in fact, Western European prosperity remained broadly constant this year, but North America fell a fraction behind into second place. The key gains for Western Europe this year were in Governance and in Business Environment. Judiciaries were perceived as more independent of governments; there was greater freedom for the legal system to challenge regulation and more transparent policymaking. In Business Environment, the region saw better intellectual property rights and improved business infrastructure. However, the region has continued to decline in Social Capital this year, especially in the area of civic engagement – people are donating to charity less, volunteering less and are less likely to voice their opinion to public officials. People are also reporting less opportunity to build friendships than last year. Norway rose to first place in the Index in 2017; and a notable contribution came from improving Health. Norwegians are significantly more satisfied with their healthcare than ten years ago, and measures of emotional wellbeing have improved. However, obesity rates have climbed a little. Portugal’s Governance improved fastest in Western Europe this year, due to improved regulatory quality and perceptions of government services, a more independent judiciary and more women in parliament. Citizens now have greater confidence in government and in the outcome of elections. Economic Quality improved faster in Ireland than anywhere else in Western Europe. Businesses perceive more open trade and greater encouragement of competition from the government, unemployment has fallen and economic growth is on the rise. Greece has struggled in almost all pillars this year, but particularly in Education. Primary completion rate recently fell to its lowest value for 40 years, people are increasingly dissatisfied with local schooling and also believe that young people are not learning. Social Capital in Switzerland fell this year, as people were less inclined to help strangers, less willing to donate to charity and voiced their opinion in public less frequently. France saw a decline in its Personal Freedom score, driven by reduced civil liberties, and in particular increased controls on dress and religious symbols caused by aggressive counterterrorism measures. 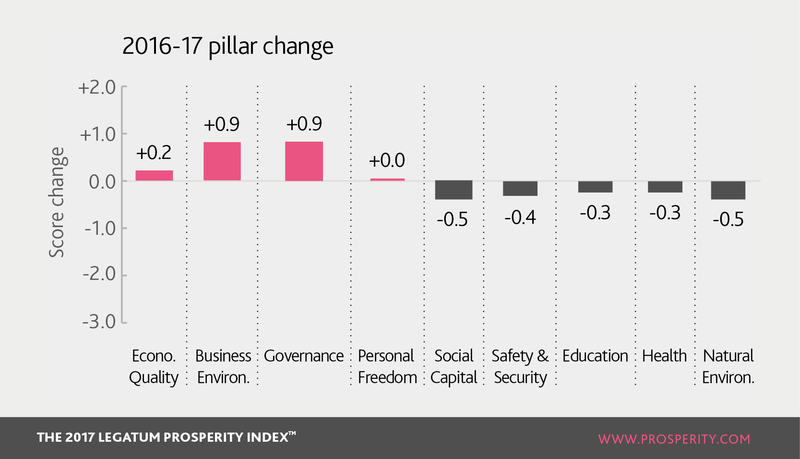 Western Europe’s high levels of overall prosperity have been rigorously tested throughout the 11 years of the Index. This began with the financial crash in 2008, followed by the ongoing Eurozone debt crisis; and there has also been pressure on institutions, particularly in the wake of more frequent terror attacks. But perhaps most significant in terms of its effects on such a wide range of Index pillars has been the impact of the stark rise in migration into Europe in the last five years. In spite of the pressure from all of these events, the region appears to have risen to its challenges, notwithstanding a lack of improvement over the last year. 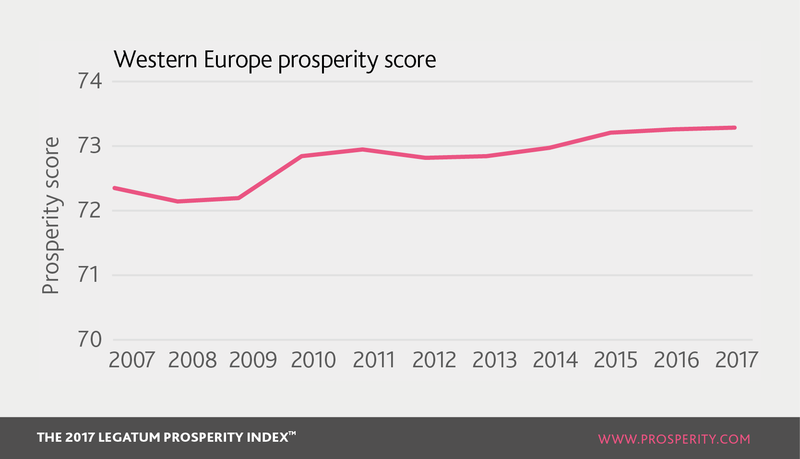 Western European prosperity has actually grown in the last decade; and having sat behind North America for the last ten years, it is now the most prosperous region in the world. But this growth is not at all uniform within the region, and in fact masks an ongoing disparity in prosperity between North and South. All of the region’s growth in the last ten years comes from the northern nations, which increased their score by 2.2% compared to 2007, while the South has actually stagnated over the same time period (Figure 1). In absolute terms, the North has a significant prosperity surplus over the South and the gap is growing – whereas the North would rank fourth overall if treated as a country, the South would sit in 22nd place, a shade ahead of the Czech Republic. More than 100 years ago, sociologist Max Weber identified not only that the northern European nations enjoyed a higher standard of living than their counterparts in the South, but also that their academic institutions were of a higher quality and that they benefited from a far greater strength of social cohesion. He recognised that the difference in fortunes between the two was not only a question of financial wealth, but it also had implications for citizens’ social wellbeing. Looking to the Index, the disparities he identified between North and South persist today in 2017; and in addition we can now see the effect of the sub-regional split across a far wider range of social and economic measures. For example, within the Economic Quality pillar, this disparity in standard of living persists; but there is also a strong surplus for the North in its encouragement of competition, ease of trade and participation in the workforce. In all but one of the thirteen indicators of the Economic Quality pillar, the Northern nations lead the South, the only exception being the diversity of exports. Whereas it is marginally easier to start a business in the South, it is far easier to access credit in the North, financial services are more affordable, intellectual property rights are better and populations perceive there is greater worth to hard work. Governance is another area in which the gap is large – judiciaries are more independent in the North, governments are perceived by their citizens to be less corrupt and it is far easier to challenge regulation. However, not all of Southern Europe’s struggles in prosperity terms over the last decade have been endogenous. The recent migration crisis has placed a considerable burden on receiving nations such as Italy and Greece, who have borne the broader cost, being the first port of call for those risking the crossing from neighbouring MENA. Italy, and especially Greece, have experienced decreasing social tolerance, both of ethnic minorities and immigrant communities.